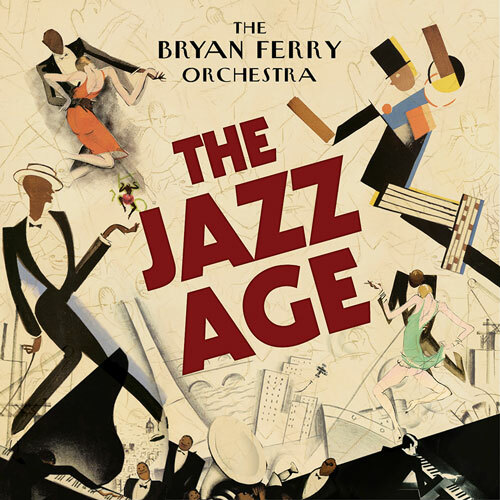 Bryan Ferry released his new album “THE JAZZ AGE” on the UK on 26th November 2012. If there was ever a musical icon and a decade destined to come together it is Bryan Ferry and the roaring 20's. The artist – a creative powerhouse, with a dazzling career of endless surprise, delight and innovation; the Decade – a time of turbulent decadence, modernity, mayhem and the era of the bright young things - each driven on by the Thrill Of It All. So what better way to celebrate and mark the 40th year anniversary of Ferry's incredible career as a singer and songwriter, than by rearranging his own compositions and have them performed in a 1920's style by his very own Jazz Orchestra? It began as an idea, fuelled by Ferry's fascination of that time between the wars known as "The Jazz Age". He decided the songs were to be all completely instrumental reinterpretations. ‘Most of the music I listen to nowadays is instrumental," he explains "and I wanted to let my songs have a different life, a life without words’. He put together his very own jazz orchestra comprised of many of the great British jazz players from his past tribute to the 1930’s’, the album ‘As Time Goes By - including his long-term musical director Colin Good, with whom Ferry worked closely on these new arrangements. The album is now available an canbe ordered in the UK from AMAZON & PLAY. Produced by Bryan Ferry and Rhett Davies, 'The Jazz Age' will be released on Monday, 26th November 2012 on Vinyl, CD and Digital editions. I started my musical journey listening to a fair bit of jazz, mainly instrumental, and from diverse and contrasting periods. I loved the way the great soloists would pick up a tune and shake it up - go somewhere completely different - and then return gracefully back to the melody, as if nothing had happened. This seemed to me to reach a sublime peak with the music of Charlie Parker, and later Ornette Colman. More recently, I have been drawn back to the roots, to the weird and wonderful music of the 1920s – the decade that became known as The Jazz Age. I would like to thank Colin Good and the other outstanding musicians featured on this record for bringing a new an different life to these songs – a life without words. ‘I Thought’ - BMG Rights Management/Opal Music.